I've searched with the help of Google through the forums and other sites to get some feedback on what Canards have best fitment and come pre-tapped for bolts. Most info I see is from older sites which either no longer carry them or do not exist. I purchased a KBD V2 and am looking for a decently priced Carbon Fiber Canard set. I figured I may wrap the lip in the high gloss carbon from Vvivid so carbon canards can go with it. Worst case I go with primer. I found an eBay seller who was out of office and has not yet responded to my PM to confirm if these are predrilled. Any experience? Also curious to those who have bought a KBD or another V2 bumper that does not have the markings to drill for canards. Did you just use the ol' ruler, painters tape, and measuring tape to mock them up? Same seller with unpainted version shows they are tapped for bolts, the carbon do not look that way. There are no "proper" V2 canards as NISMO branded bumpers never used them in the first place. As for recommendations, you'll probably get as many opinions as those who've tried fitting them to their cars. While I like the aerosync V2 bumper on my street Z, I chose not to add anything like canards to it, as they lack any function on a street driven vehicle. Aero add-ons aren't allowed on my 350Z race car, so there's no use for them at speeds they might actually add some functional downforce. Thanks for replying. I guess I should clarify, I mean good fitting Nismo V2 style canards. The plain V2 has too much blank space for my liking, I would have gone with a Mines style lip or V3 otherwise. I only drive C-Street SCCA Solo at the moment so not worried about rule limitations, it's a visual thing. Also, i thought Aerosync only made the Nismo Version 1 bumper, they had a V2 also? Last edited by BQPham; 03-06-2018 at 12:06 PM. Sorry- I misspoke. Aerosync only produced V1 style bumpers. Back OT- the fit of the cannards will depend on the contours of your V2 bumper. Why not make your own with some ABS plastic? You can get the contours just right and attach and paint them for a fraction of the price. My canards came with my rep V2 bumper, but it looks like you can purchase them from Shine Auto Project in either FRP or CF. No actual pics of the canards by themselves on their website except the ones mounted on the V2 bumper. It seems like those are the look you're going for. I've never ordered anything from Shine, but it seems the overall consensus from the forum is that fitment is pretty good. Yeah I've seen Shine's stuff in person its great, but their shipping costs to NJ kill me so I never end up pulling the trigger. I'm trying to stay sub $100 for canards, i think Shine charges just about $120 for non carbon and $220 for carbon shipped. 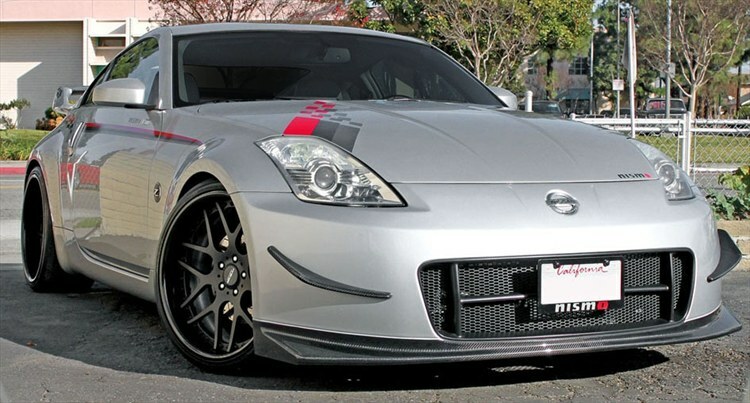 Search is over the proper fender flares for the 350z. I tried to search, but the search funtion is broken..HELP! Any one have experience with EPR Carbon fiber RB style spoiler?